Every officer and worker must be well equipped and fully skilled in their respective trade to upgrade and enhance capacities, advocated Thangwang Wangham, Parliamentary Secretary Power. Speaking as Chief Guest here at Itanagar on Monday on the inaugural day of the 5-days training on power system control function organized under capacity building programme of the department of Power, the PS highlighted the importance of routine training on the latest technology relating to the department for quick and quality deliverance of service to the public. He lamented the lack of work culture and skill amongst most of the employees. 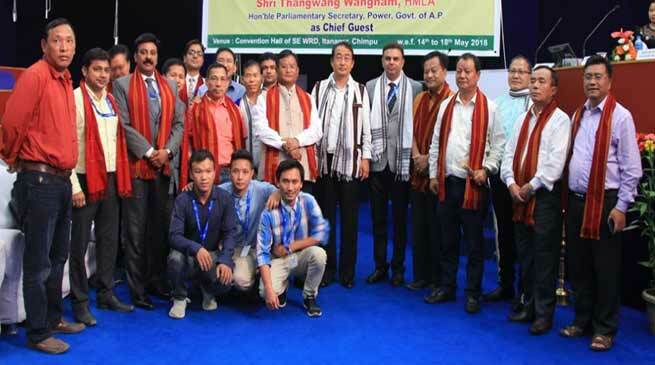 ‘While the State government is fulfilling every demand of its employees and workers with all sincerity, the employees also have to reciprocate with equal sense of commitment by putting extra effort in serving the public’, said Mr. Wangham. Underscoring the need to cope with technology in this constantly evolving world, Wangham appealed the officers to adapt with time for which reading books and attaining training courses from time to time are the most effective ways. Finally, he suggested making the training program a regular phenomenon to train and updates the officers and workers on the latest apparatus of electrical department. However, the training must be conducted at Division and Sub Division level so that the normal functioning in the site is not affected, added Mr. Wangham. Earlier in his keynote address, Er. N. Perme, EE SLDC who has been assigned to oversee the training programme, explained in brief about the technical aspect of the same. Er. Anong Perme, CE TPM Zone also addressed the officers and urged them to make most of the training. To end the inaugural session of the programme, Er. HR Bado, SE Transmission while thanking the Chief Guest for gracing the occasion, highlighted the present status of the Power department of AP and mooted for un bundling of the electricity to ensure better delivery of service while optimising revenue collection for the State coffer. The training which is a first of its kind in the State was attended by the Chief Engineers of Western Elect Zone, Central Elect Zone and Transmission and Distribution Zone besides SEs of the department of Power. The Tata Power DDL, New Delhi who has been roped in to impart training to the officers of the department was represented by Mr. Bharat Chabra, Head Tata Learning Centre, Tata Power DDL, New Delhi with his team.